Even though I take charge of the kitchen in our household, I have to give credit to my husband. He's certainly showed me a thing or two in the kitchen... even if by association. He used to work for the ever popular, Trader Joes grocery store. I was pretty psyched when he got the job - moreso than he was! I love shopping there and wandering the aisles of all their fun, out of the ordinary products. One day when I was shopping at Trader Joe's the demo station was giving out these samples of sopressata (a type of sausage) wrapped with a mild cheese and a fresh basil leaf. It was so simple to put together, but more importantly, it tasted great! 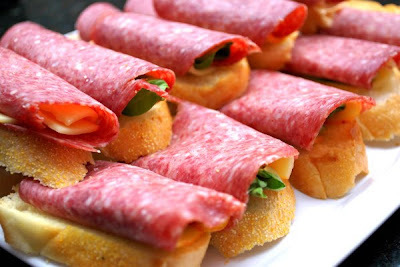 It definitely was a new way to serve cheese and sausage with a bit of fresh herbs to brighten the flavors. I liked the demo so much that I ended up buying the ingredients used to make it. This was about a year ago and I haven't made those sausage/cheese/basil rolls since... until tonight. 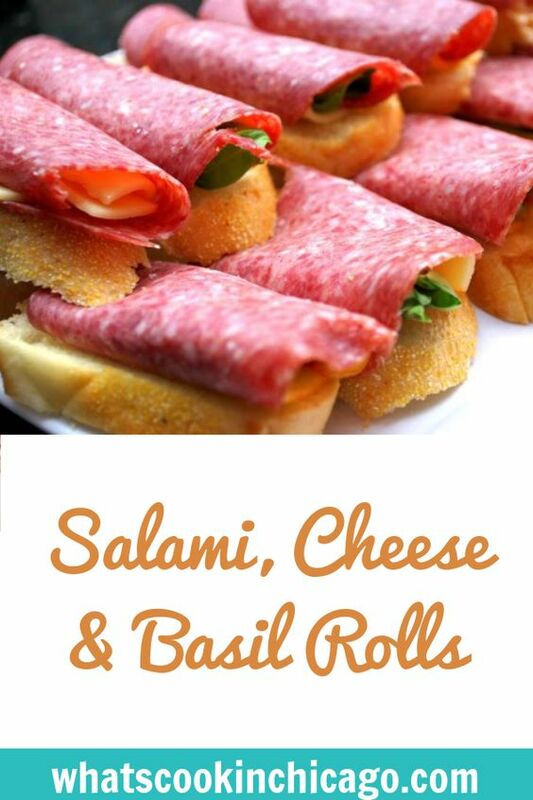 I used thin sliced hard salami, muenster cheese and fresh basil and they were a fantastic, simple appetizer to serve my dinner guests. Stack a slice of salami, muenster cheese and a basil leaf. Carefully roll the stack into a log. Place on top of a toasted crostini and serve. This sounds like my kind of appetizer! I can never get enough cheese/bread/etc. I like this spin, and it looks like a great idea for a crowd. mmm, my aunt had something like this at her house one day. It was delicious! Have you seen the mozzarella log that rolls out? Kinda weird, but would be perfect for this type of thing. 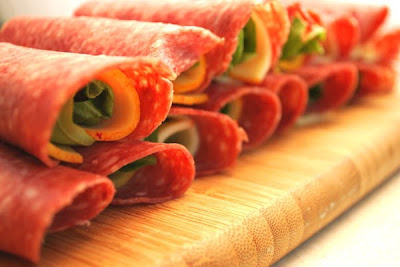 Unroll it, lay down the salami & basil, roll up and slice! I love this pairing - this would be gone in no time flat in my house.